Se-Jong Tae Kwon Do is a not-for-profit educational organization dedicated to teaching the art and mental and physical disciplines of the martial arts. We currently have 19 schools, most of which are in the western Pennsylvania area, with one in the Philadelphia area and one in Wilmington, North Carolina. There is no charge to attend our classes, other than a nominal yearly fee to cover insurance for the classroom spaces we use. The beginning student should wear loose, comfortable clothing to class. When beginners earn their White Belts, they are encouraged to purchase a uniform, (we carry them) but it is not required. Students are tested for their next rank, generally, every six months. Most Instructors require a minimum age for students of 10-12 and parents are encouraged to participate. Mr. Horneman's class, in Brackenridge, is solely for students in First through Sixth grades. 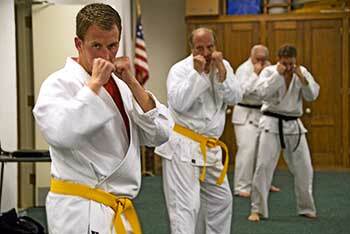 Se-Jong Tae Kwon Do was founded by Father Robert Connolly, an Eighth Degree Black Belt. He wanted to share the benefits of martial arts with others, and so began teaching in 1974. The first classes were held in church halls, as many of them are today. He had no desire to benefit financially, so he never charged for the classes. This tradition continues today. No one is paid in our system, our Instructors teach because they love teaching Se-Jong Tae Kwon Do. Although most classes are held in churches, there is no affiliation or religion involved in Se-Jong. We focus on improving the self through physical and mental discipline, thereby increasing self-confidence and respect for others and oneself. We stress high moral and ethical values through being a good person. Beginners have their own class and are provided special attention, as that stage of development is so important. Classes are grouped by belt rank, with beginners on their own, then intermediate levels, then advanced levels. Individual attention is given to each student. 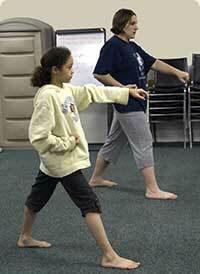 Discipline is a big part of Tae Kwon Do, and understanding and knowing how to control the body is crucial. Movements are precise and have underlying concepts which must be understood, and practiced. Students have reading material to learn (although not too much) and memorize for each test, and must take time outside of class to practice the movements. Practice outside class is mandatory, as each class meets only once a week. Once a student has reached the White Belt level, he/she is encouraged to attend our other classes for extra practice and learning. Anyone is welcome to observe a class at any time and speak with the Instructor. This will help the prospective student to see what is expected of them. If a student is in the 10-12 year old range, a parent is required to take class with the student. Parents or friends are always welcome to stay at class and watch, and are encouraged to join in. Beginners are welcome to start in a class within one month after the class has had a test. Advancement tests are given approximately every six months. Still have questions? Send us an email and we'll do our best to answer.